For this review I am covering an arc from a great book. This arc handles a subject that is personal to me, depression. I have to thank my co-creator Tony for pointing this arc out to me. 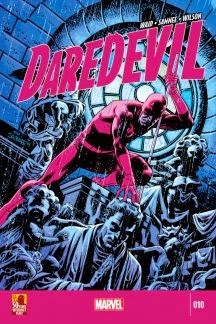 I have really enjoyed the first two arcs to Waid’s Daredevil run, but I fell off shortly after. Not because I didn’t like it, but because I was already picking up so many books. The light hearted feel that Waid brings really breathes new life into the character. And then you have the stable of artists that have worked on this series. There wasn’t a single artist to work on it that didn’t bring their own feel to book while still keeping with the same general attitude and appeal. In this arc Waid brings in Purple Man, a villain that really stands out in every book I have read that he has appeared in. Even if his name is kind of hokey, he is a diabolical character that can control whoever he talks to. But he isn’t alone. As the book opens it is revealed that over the years Purple Man has been creating a family for himself by sleeping with women then making them forget that they slept with him. Each of the kids are harmless alone, but once they are gathered they have a power over even the Purple Man. The kids have the ability to control emotions of anyone near by, and make Purple Man try to kill himself. 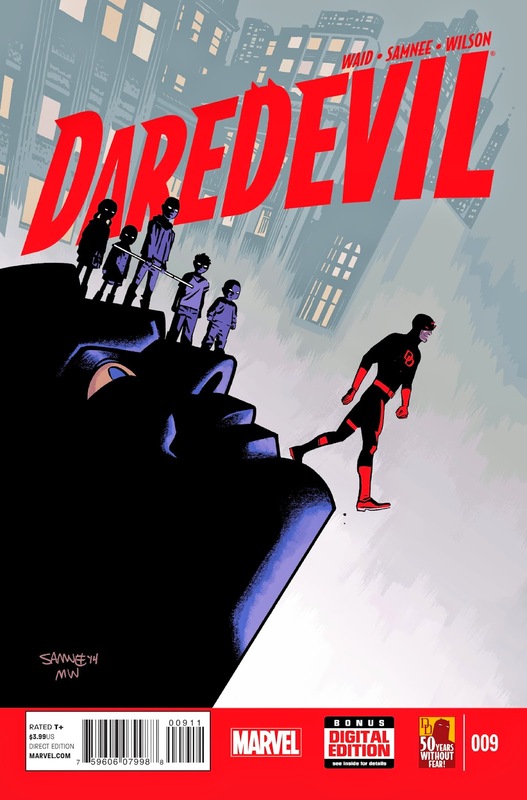 Where Daredevil comes in is Matt is currently thinking about writing an autobiography. But Foggy is worried about what dark memories will resurface if he tries to relive them. And when the children start riots in the streets because of their powers, Matt jumps into action to attempt to save them at first thinking they are under the influence of Purple Man. But when he gets close to them he realizes the effects are coming from them. By the time he realizes it though their powers take effect on him and drag up all of the dark memories that Foggy was worried about surfacing. Depression really takes center stage at this point. And Samnee’s art really makes for a great vehicle to get across what is going on in Matt’s head. First through a page of five split panels. One side being half of one of the kids face, the other side being half of Daredevils face and a bad memory being dragged up. But at his darkest moments the panels are extremely simple, only showing Matt in his radar view in fetal position on an all black panel. The thought bubbles on these panels perfectly explains what it feels like to be in the grips of depression. 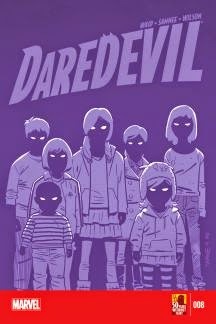 Daredevil gets a grip enough to stop Purple Man from going after his kids and separates the kids to negate their powers. But the wrap up of Matt’s bout with depression took all of the attention from it. He tries his hardest to hide how much he was affected by the encounter, but his girlfriend sees right through his bluff and stays by him to help get him through it. The creative team of Waid and Samnee work well together. These three issues make for a great read with beautiful imagery. I will probably go back at some point and read more of the previous issues of the run. Ratings: 4 out of 5. I highly suggest this three issue run. It uses a really good villain that is often overlooked, and tackles an issue that is just as overlooked. Thanks for reading my review. If you have any comments or suggestions leave them in the comments section. And remember, keep reading comics fans.